The incredible bio diversity of Suqatra has been compared to the Galapagos Islands and it is listed as one of the top ten most endangered island ecosystems. This enchanting and little known island also known as Socotra is located off the coast of Yemen in the Middle East. Isolated from the rest of the world its plants have evolved into many bizarre shapes and forms that are unknown in other parts of the world. 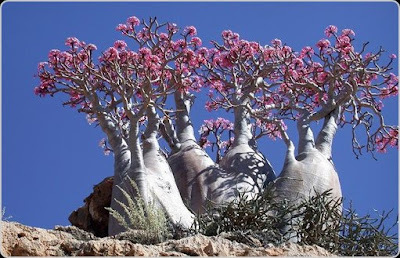 One of the most famous of these is the Dragon's Blood Tree the sap of which is used to make crystals that can be used as a dye or as an alleged aphrodisiac. The plant depicted on the right is the strange Desert Rose (Adenium obesium) but sometimes more popularly called the Elephants Leg Tree. The Island is slowly becoming known to the world and has great potential for eco-tourism as long as the visitors don't do more damage than good. Other species include the Cucumber Tree and the Socotran Fig. Suqatra was listed as a World Heritage Site in 2008.